October 12, 2010 - EasyJet, the UK’s largest airline, announces it has resolved its litigation with easyGroup IP over the terms of the ‘EasyJet’ brand license. 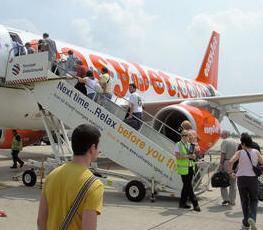 A revised brand license agreement ends the long-standing uncertainty arising from the on-going dispute and confirms EasyJet’s right to generate revenues from ancillary activities. EasyJet Airline is a British airline headquartered at London Luton Airport. It carries more passengers than any other United Kingdom-based airline, operating domestic and international scheduled services on 500 routes between 118 European, North African, and West Asian airports. The amended and re-stated license agreement continues EasyJet’s worldwide rights to the use of its brand on a basis which protects EasyJet’s current commercial activities and provides clarity and certainty over the terms of the license. Operational flexibility is considerably improved and EasyJet will have the freedom to enter new co-branding agreements with other travel service providers as well as white label partners such as car hire, hotels and travel insurance companies. In addition, EasyJet will have the right to enter co-branding promotions with other leading brands. Upon obtaining shareholder approval for the revised brand license, Sir Stelios has agreed to give up the right to appoint himself as EasyJet Chairman and end easyGroup’s rights of representation on the Board of EasyJet. “EasyJet has grown and developed since the brand license was signed and the license agreement needed to be clarified to allow the Company to move forward. I believe the revised agreement better aligns the interests of EasyJet shareholders and the Licensor. I’d like to thank Sir Stelios for his constructive approach to our discussions over the past few weeks. Sir Stelios created EasyJet and its success is a tribute to his vision and energy” said EasyJet Chairman Sir Mike Rake. “As the largest single shareholder in the airline as well as the owner of it's brand, I hope that the new team, led by Mike, Carolyn and Chris, will use this expanded scope of the brand license to create value for all shareholders” said Sir Stelios Haji-Ioannou easyGroup Chairman. “The way low cost airlines make money has changed over the 10 years since the original license was signed. This amendment allows the airline to now grow its business even further by removing some of the restrictions imposed by the original agreement. “This is a sensible resolution of a difficult dispute that provides a fair, clear, workable outcome that is an improvement for both sides. It provides EasyJet with operational flexibility and commercial freedom to grow our business and it provides both sides with clarity” said Carolyn McCall, EasyJet Chief Executive.